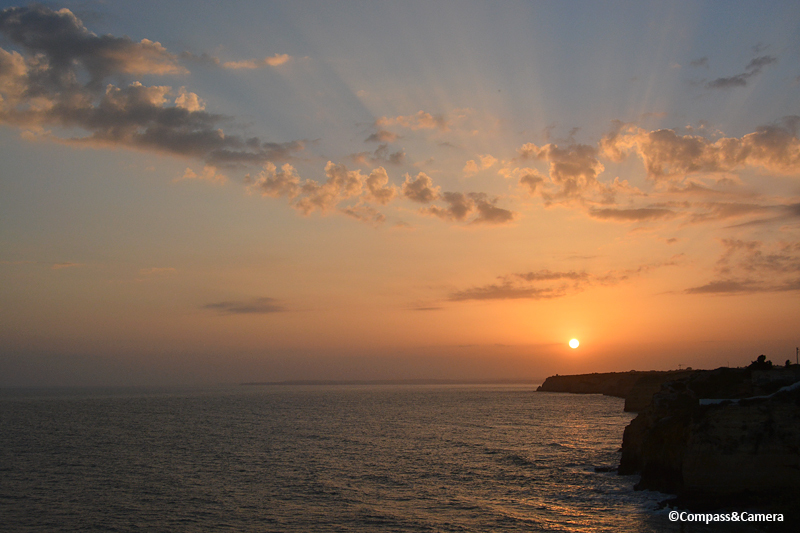 Right at this moment, it’s sunset at my little outpost on the world map and I’m reminiscing about this moment of magic on the southern coast of Portugal. 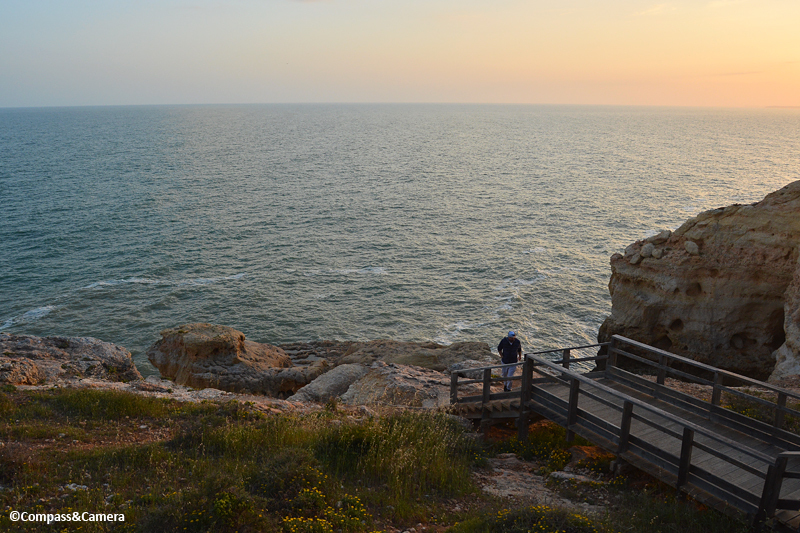 Out for a sunset stroll, we found the boardwalk in Carvoeiro. Looking east … a blue-green sea below sandstone cliffs. Looking west … a glowing sky becoming more radiant by the second. There is always that brief, exact moment when the colors hit peak saturation before letting go and drifting over the horizon. 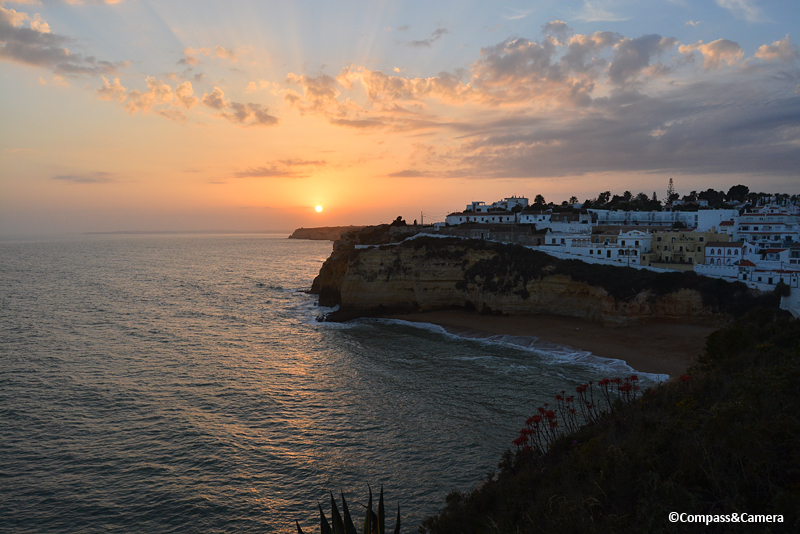 One last look as Carvoeiro rested under the light. I’m late for the Rise/Set Weekly Photo Challenge but didn’t want to miss sharing this coastal moment, real and unfiltered. It’s nice to resurface and take a breath after a long stretch of work. Now all I need is a bottle of Madeira wine. Gorgeous photos. Such beauty. I need to go find me a good sunset! Mmm it is such a very pretty part of the world. 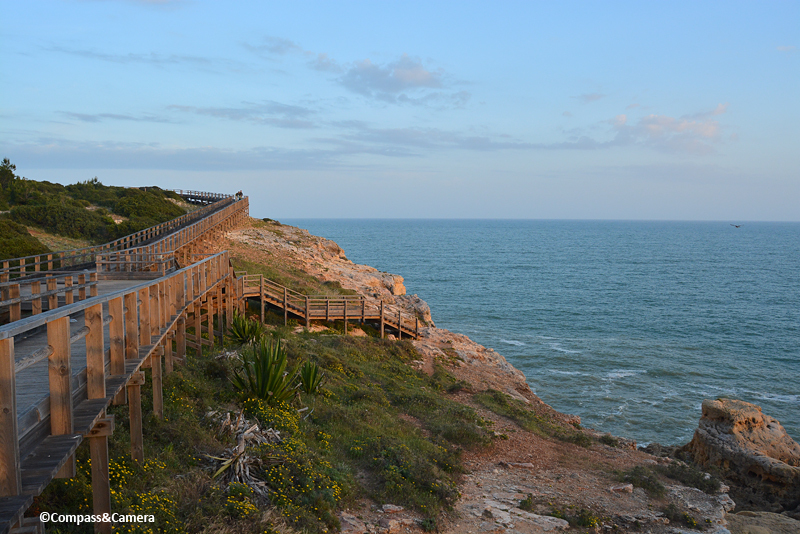 I love the wooden beach boardwalks in Portugal ~ we were at this same lovely spot during off season a few years back. Thanks for sharing your memories amd dramatic photos. Sooo pretty – I can see why you’d want to revisit these! Miss seeing you around here … although I’ve been pretty darn absent myself. Hoping my trip starting tomorrow prompts a few new posts! Lex! Thanks for your comment! Sorry it’s taken so long to reply. I appreciate being missed! 🙂 Life takes over sometimes! We’ve left Canada and are starting a new adventure. We had to pack up the house, get it transported and stored in the US and do everything else a big move requires. I know you know how that goes, ha ha! Looking forward to writing a post about it. Heading to Mexico on Tuesday. I need to catch up on your posts! Saw a few photos of Italy on Insta. Looked amazing!!! Hope you had/are having a great trip! xo, K.
I’ll be in Mexico City May 21-23 … just in case that’s where you’ll be!! Good luck with your new adventure! Thanks, Randall! It’s all true — Portugal is a gem, and still somewhat off the radar although that’s changing quickly. Definitely worth a trip to just “be” there — eat, walk, look, drink wine and watch the sunset. Nothing more required. Hope you’re doing well! I’ve left Canada. Embarking on a new adventure! I need to get to Portugal ~ especially since I’m located in Europe for now…take advantage of the opportunity while I’m here 🙂 Wow, you’ve left Canada ~ now where is your new adventure taking you? Cheers to a great day. I’m currently nomadic, with a first stop in Tulum, Mexico for five weeks. Then Lake Tahoe for a couple weeks in July. After that … TBD. Where in Europe are you? Might be there later this summer or fall. Beautiful. You know I love a surfeit of sunsets (and sunrises)! For sure! 🙂 Thanks, Bespoke!